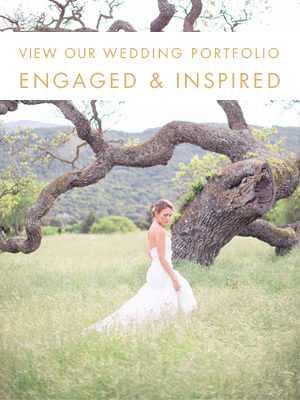 Today we are announcing a new Engaged & Inspired series, Planning a Wine Country Wedding. This series is written by one of my favorite Wine Country wedding planners, Laurel of Esla Events. Esla Events is responsible for some absolutely gorgeous weddings, no seriously, check out her gallery of work. Truly breathtaking. Find out more about Laurel and Esla Events right here. Take it away Laurel! I’m thrilled to contribute to Engaged & Inspired’s wealth of information and insight for real brides who are planning real weddings. My four-part series will focus on planning a wedding in Napa, Sonoma, and the surrounding areas. While I have a few ideas for the upcoming posts, I want to first open it up to you, Engaged & Inspired readers: What would you like to know? Feel free to email me directly at laurel@eslaevents.com, or leave a comment on this post. Two of the first major decisions you’ll need to make when planning your wine country wedding are where and when to get married, so let’s begin there. “When” is relatively straight-forward. Prime wedding weather in Napa, Sonoma, and surrounding areas is mid-May through mid-October, with the most reliably comfortable months being June and September. However, couples get married year round in this beautiful area. Even now in February, there are beautiful blankets of yellow mustard among the vineyards and, just yesterday, I was comfortably running around Yountville in a dress. The weather is of course less predictable from November to April, but if you’re on a budget or have a challenging schedule, don’t feel limited to just the prime summer and fall months. "Where” to get married is the more interesting, and often more personal and challenging, question. How far from San Francisco do you want your guests to drive? If you want to encourage all guests – including your San Francisco friends and family – to make a weekend of it and stay overnight one or more nights, select a venue in Healdsburg, Glen Ellen, or Calistoga, which are a solid 1.5-2 hours outside San Francisco. This can make for livelier receptions, as your guests won’t have to worry about driving home after the celebrating (assuming you provide transportation back to the main hotel, if needed). However, if convenience is a bigger factor for you, and you don’t want to ask your out-of-town guests to drive another two or three hours after their cross-country flight, then opt for a venue near the cities of Sonoma or Napa. Some favorites include The Carneros Inn and Gundlach Bundschu. How late do you want your wedding to go? Local noise ordinances makes outdoor dance parties impossible after 9 or 10pm. If you want to twirl late into the night with your friends and new husband, seek out venues with indoor reception areas, such as Cline Cellars and Calistoga Ranch. Do you want cocktails to be served? If so, be sure to check whether the venue you’re considering allows hard alcohol. Many vineyards only allow wine (often only their own) and beer, but many other types of venues allow both, especially hotels and estates, such as Solage and Beaulieu Garden. What does an “intimate setting” mean to you? Many couples are drawn to wine country for the promise of an intimate, relaxed, and beautiful setting. There are many types of “intimate” in wine country though, and getting clear on what exactly that means to you and your fiancé will help focus your search. Do you want all your family and friends to stay onsite all weekend at a property like Dawn Ranch? Or do you imaging whisking all your guests away to a beautiful hideaway like Healdsburg Country Gardens? Or does is really mean renting a wing of rooms at your favorite hotel like Bardessono, and having all festivities right there onsite? Talking about those four basic questions with your fiancé will help focus your search, and make the most of your initial visits to the area. Once you have an idea of what you’re looking for, check out search tools like Here Comes the Bride, the local venue list at The Collection, or simply cruise around Engaged & Inspired and other blogs for leads. I recommend seeing no more than 3-4 sites in one day to avoid venue-overload. And now for a little visual fun: photos of a few of my favorite venues by some of my favorite photographers! The Carneros Inn For those of you skeptical of hotels as wedding venues, this modern-meets-rustic oasis will win you over with its impeccable design (no crazy carpets here! ), beautiful layout, and private-feeling event areas. One of my favorite spots. Annadel Estate Winery This is one of the most intimate and beautifully raw settings I’ve come across in Wine Country. The vine-covered ruins are the centerpiece of the property, and they’re beautifully complemented by a large lawn and barn. Calistoga Ranch For smaller weddings, this gem offers several different site options, including a beautiful lawn area overlooking a small lake on one side and a valley on the other, a gorgeous pool area, and a cozy wine cave. Gundlach Bundschu While I haven’t personally planned a wedding here yet, I’ve visited the wine tasting room many times and have fallen in love with the ceremony site. Conveniently located near Sonoma, Gundlach sits on a hill overlooking beautiful hills and vineyards. Coming up next: TBD! Email me your topic requests, or post them in the comments below.